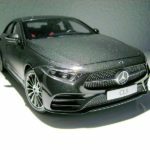 Mercedes have launched sales of the third generation of its exclusive CLS (W 257) this month, with luxurious features from the E and S Class, but a more dynamic four-door-coupe design. 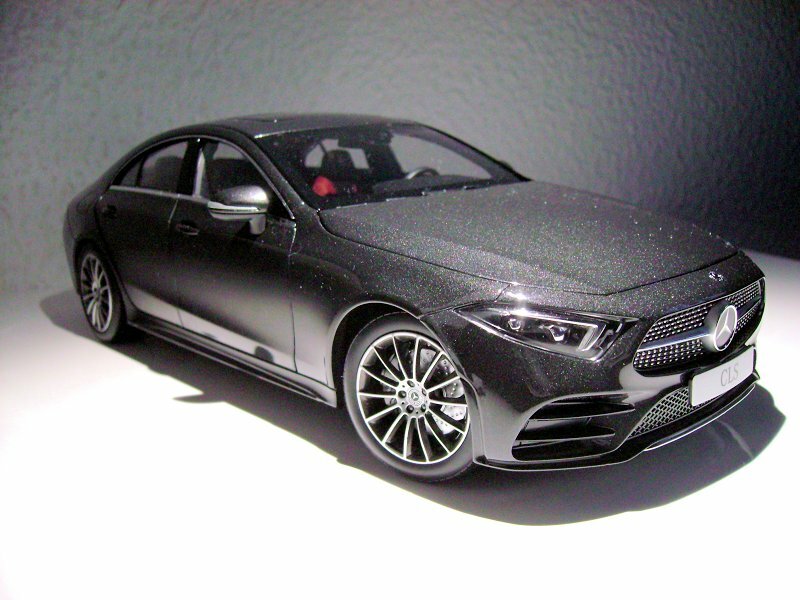 Whilst due to a new policy you don´t even get a brochure for the new cars anymore, Mercedes were kind enough to give us not one, but two versions of it in 1/18 to carry home from the show room. The differences go beyond the exterior colour, so that you have two very different versions of it. I am usually not tempted to buy one and the same model in different colours and neither have I done it this time, but it was a hard choice to make. 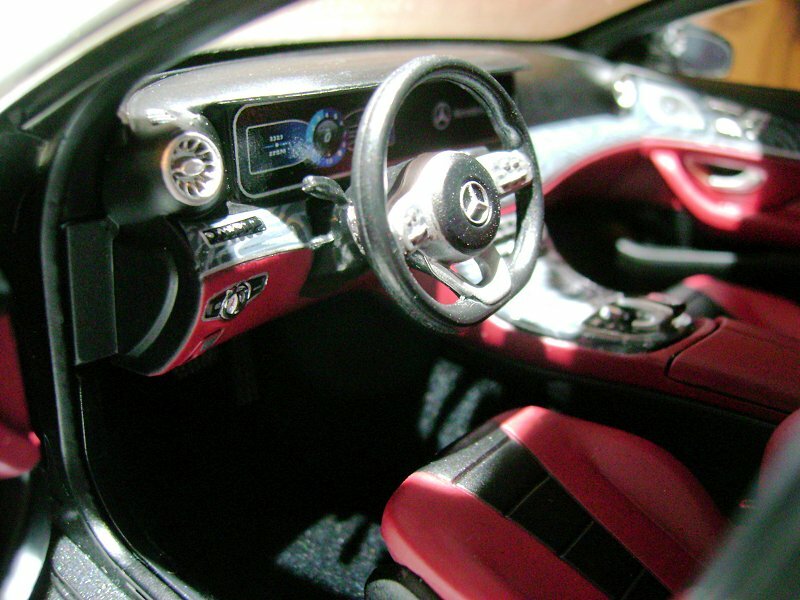 To make choices easier, both are finished to represent the AMG line, which has nothing to do with engines and power figures, only exterior trim. For the front fascia that means bigger, more aggressive jet inlets beneath the headlights and a chromed diamond-pin-style radiator grille. At this price point the grilles and inlets are not break-through of course, but convincing enough. The chrome trim on the diamond pins and the centre badge do a convincing job. The Mercedes badge on the forward leaning shark nose is AUTOart quality. 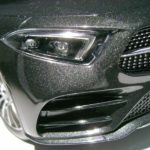 The headlights´ angry look has been compared to the Ford Mustang and really looks better than on previous cars. 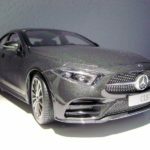 The clear lenses are almost seamlessly fit into the fender lines, but the fixing clip next to the radiator grille spoil it a bit. 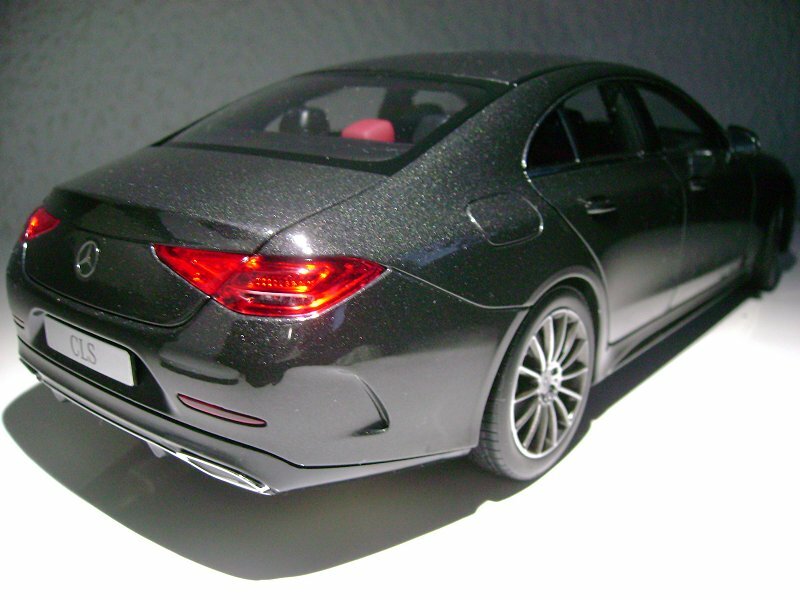 The silvery reflectors in the headlights are a bit crude on the model, but it has a convincing effect from a distance. 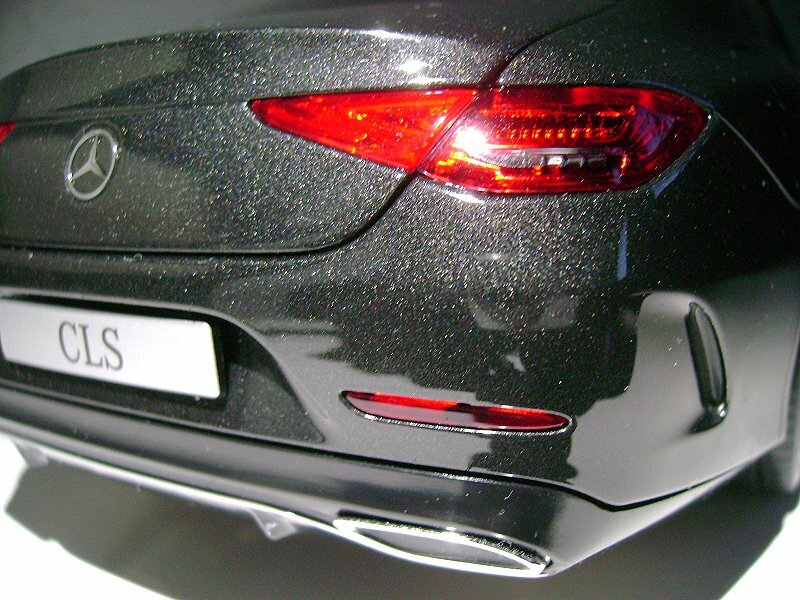 The rear has a bit of a splitter design that is framed by chrome more dynamically than on the normal trim. 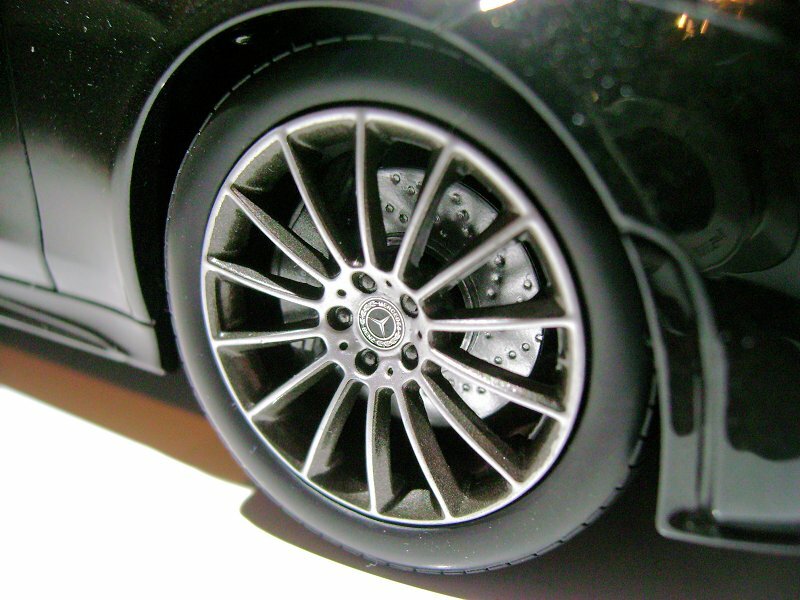 The wheel arches behind the rear wheel and in front of the front wheel show sportive air outlet slits. 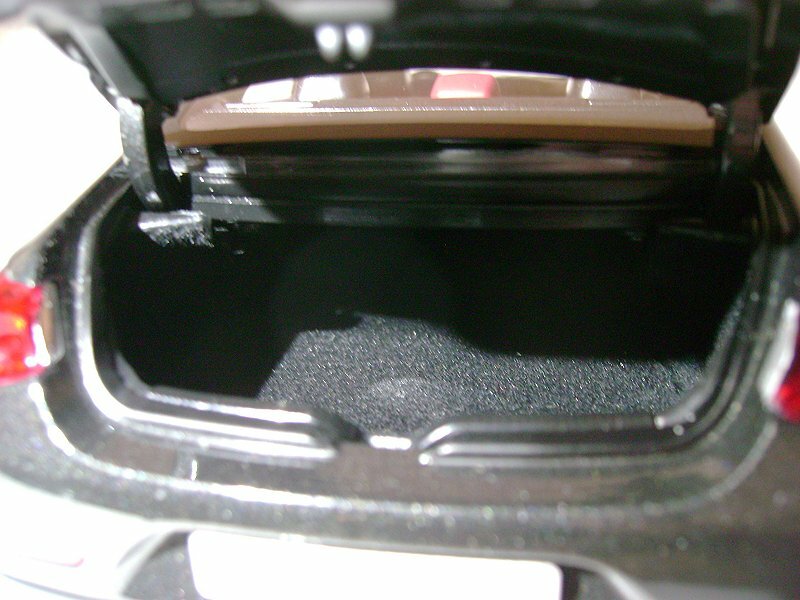 On the model, however, there is no real slit, not even a faux grille, so there is room for improvement, e.g. by customization. One reason for the grey version for me was that the tail lights stand out more prominently than on the too similarly red version. 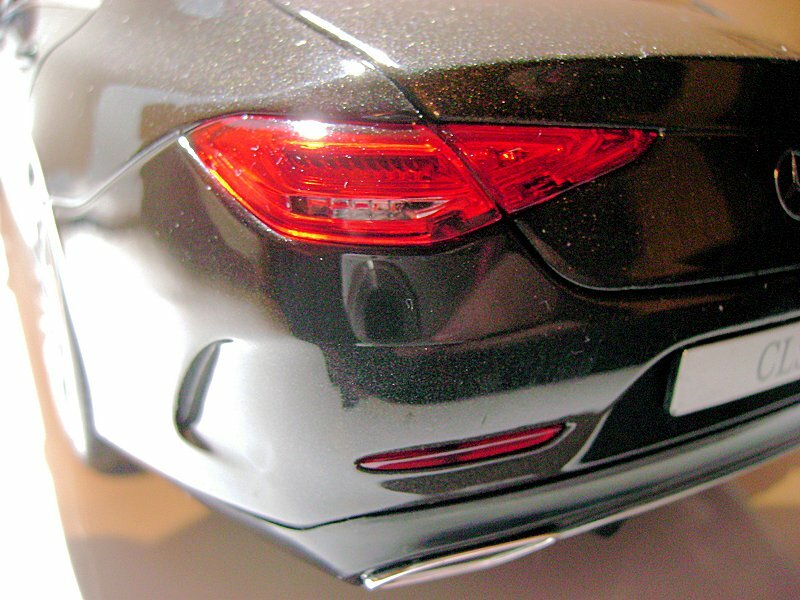 And the controversial new tail lights deserve the attention, they are more convincing than the headlights, although there is only a single mould chrome reflector piece beneath the red and white cover which, however, is moulded to represent LED pins and lines. 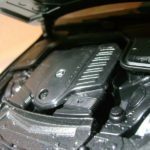 In addition, the two separate parts wrapped around the rear fenders and built into the boot lid fit very well to form a single shape. The two reflectors in the rear bumper, unfortunately, reveal as a dark spot what is the mould pin that fixes it to the bumper. 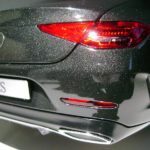 The large angular chromed exhausts are painted in black at the recessed centre to feign a hole although Norev has really lead exhaust pipes along the undercarriage to meet the exhaust on the other side. The boot lid is hinged on doglegs and opens stiffly to reveal a carpeted luggage compartment. 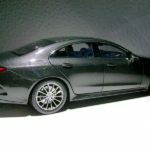 The side lines on the new CLS are deliberately kept smooth without too many creases, only a low upward line towards the rear. 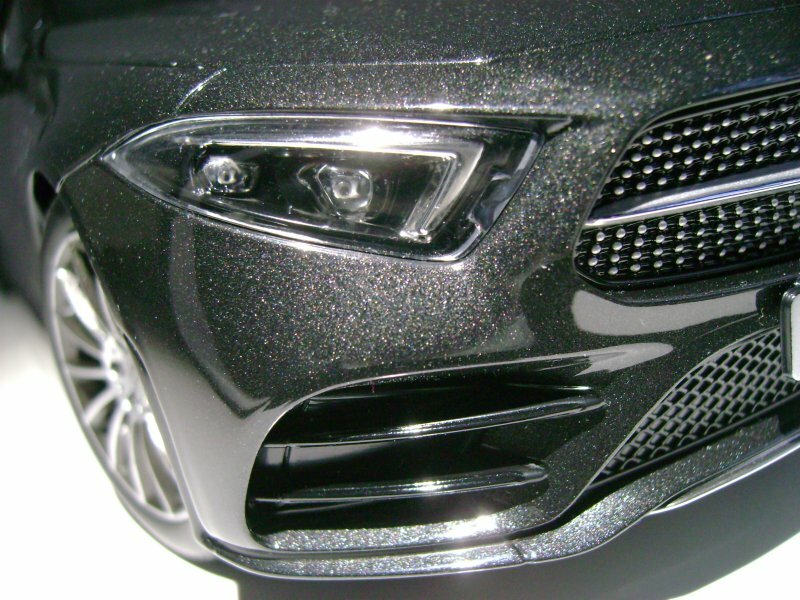 The paint, whether red or grey, is smoothly applied and has extremely fine metallic flakes, absolutely brilliant. Don´t worry, they only appear over- glittery in the spotlight of my photos, when the grey is almost black under normal lighting conditions (apologies for my photographic shortcomings). 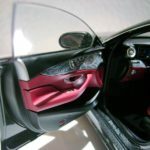 In contrast to the red CLS, the dark grey version has the clear glass frame-less side window assembly framed in chrome along the doorsill and roof. 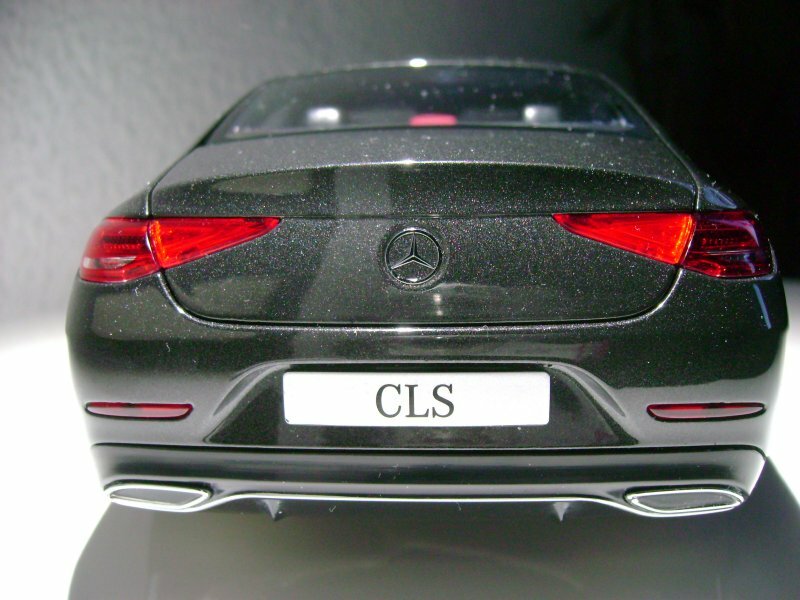 The red CLS has smoked rear windows and no chrome trim. 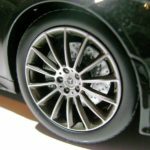 Wheels and AMG LMR 4-fold multi-spoke 20-inch rims are the same again on both versions, very well designed with arching, shiny spokes, recessed wheel nuts and fine Merc logo that would have deserved better brake discs. 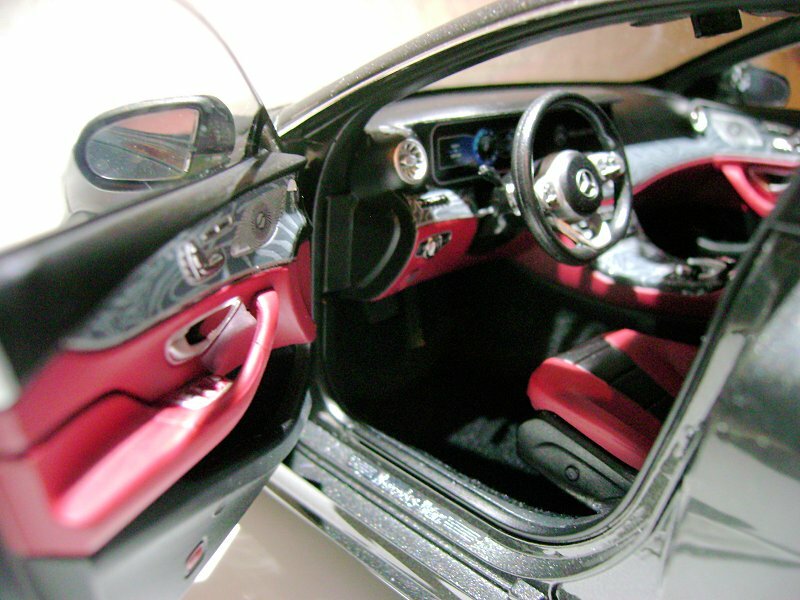 The interior is the other reason why I picked the grey CSL. 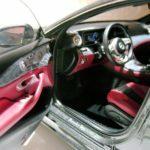 Unlike the red car, its seat and door upholstery represents the luxurious two-tone red/black leather design and has the grey ashwood veneer instead of the carbon. Again, if you keep your distance it looks really good, but open the doors and cross the treadplated threshold sticking your eyeball (or the camera lense) into the carpeted interior, and the veneer pattern looks more like urban camouflage. 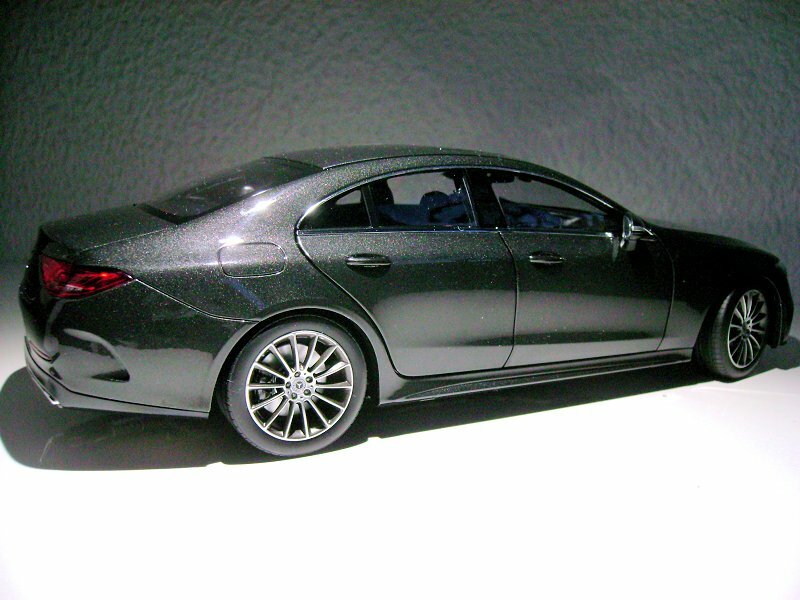 So it´s nowhere near anything we have seen on models of Jaguars, Bentleys or Rolls Royces. 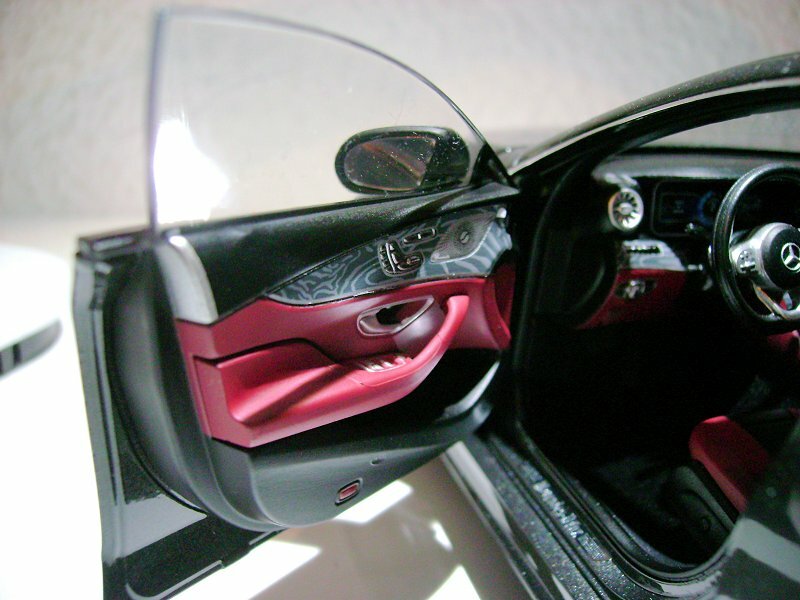 However, we have to remind ourselves that this is a 90 Euros model to put it into perspective, because the Burmester speakers in the doors, the air vents and centre console instruments are so good that some more recent (and expensive) AUTOart models are shamed by Norev´s effort. And of course, there are fabric seat belts with photo-edged buckles. 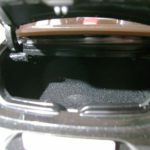 The bonnet fits so well, that you have to press the release button under the car, to open it on its stiff dogleg hinges, no struts like on the real car. 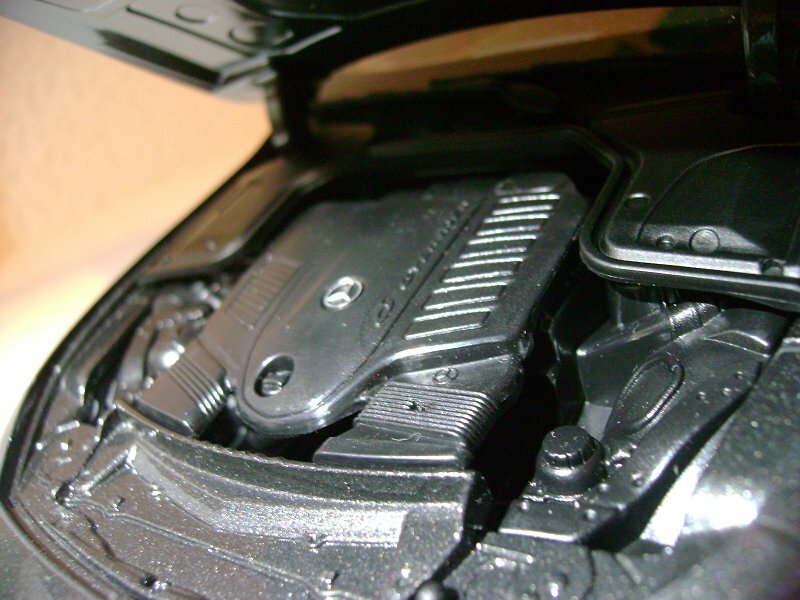 And not worth the effort, everything except the silver Mercedes star on the engine cover is black moulded plastic that will come out in probably no more than two pieces without any colour applications like for fluid lids, dip sticks or the like, engine bay lovers will find scope for customization. And there is no hint at which of the 6 cylinder engines is fitted here. 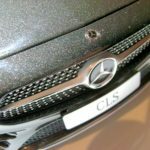 The absence of badging on the boot lid does not solve the mystery either but contributes beneficially to the smooth elegant lines of the CLS in its AMG-trim-package. 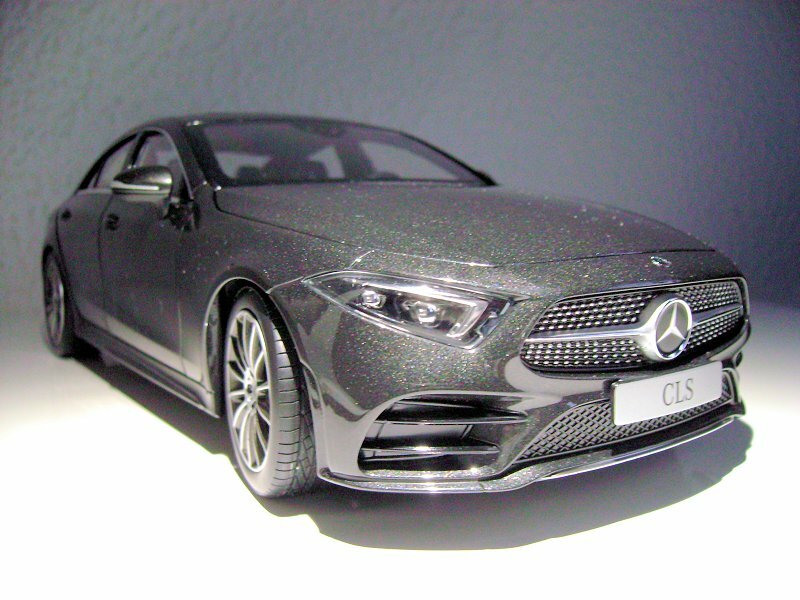 I do think, that the CLS is worth adding to your collection. It is not perfect, but very good value for money. Norev has made vast improvements compared to earlier Mercs. What´s funny is that some features are so much on pár with benchmark manufacturers or beat them at their own game that they beckon you to be enjoyed up close and personal while others are better enjoyed from the distance of beyond the display cabinet glass. This particular model will most certainly remain the only fully opening diecast model of the W257. The “real” AMG 53 may follow, but its exhaust pipes and spoiler lip on the boot do their name justice: they somewhat spoil the design. 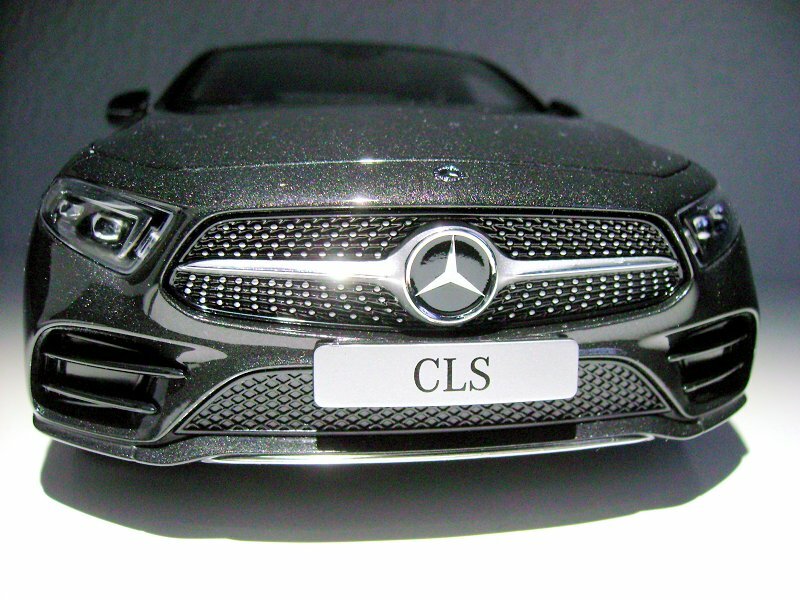 The AMG package CLS is a sleek motor, both in the sense of sporty and elegant. 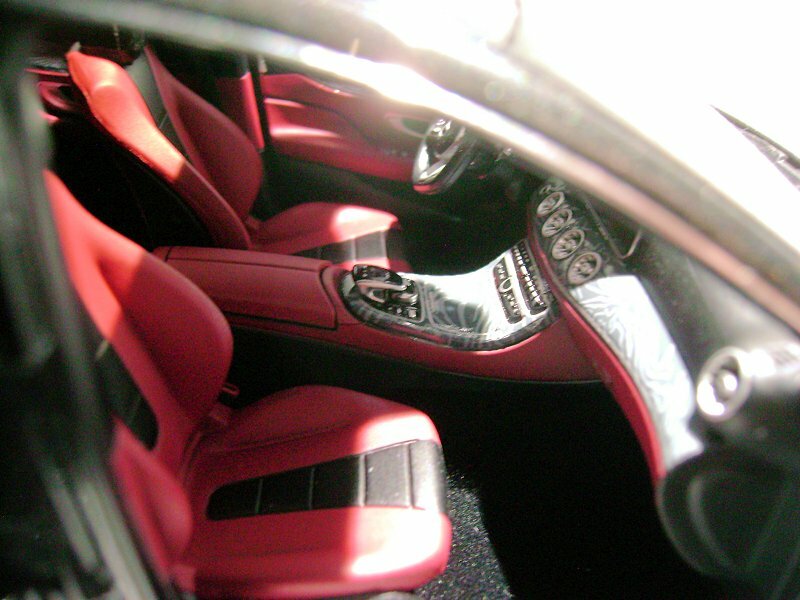 The grey version seems to underline the elegance, while the red tips the scales more towards the sporty aspect. 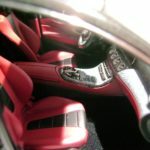 11 Responses to "REVIEW: Norev Mercedes CLS (W257) AMG Trim Package"
A brilliant piece for the price point. Thanks for the review! i’d be more interested in the Norev offering if the team focused more on the pure AMG cars. Well, than you may be looking forward to our next candidate, Norev´s dealer edition of the AMG GT-R aka “the beast of the green hell”. This car in general is hideous! Thank you very much for the great review. Another brilliant piece from Norev. I hope I will buy one, it worth. So here we go: Two comments, two different opinions: “brilliant” versus “hideous”, it reflects that the car´s design is controversial. I have a big dilemma: red or gray ??? 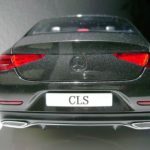 The truth is that I do not like too much this CLS, those headlights are not Mercedes, and the rear reminds me of an Audi. The only argument in favor of the gray is that the rear lights stand out more, and I have already said that I do not like them. Red and gray are the colors of the Mercedes boutique, do you know if Norev is going to get a third color ??? I wouldn´t be aware of any other colour, no. I consider it unlikely any time soon, though. 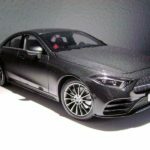 Someone will probably make the AMG 53. There are more arguments for the gray, e.g. 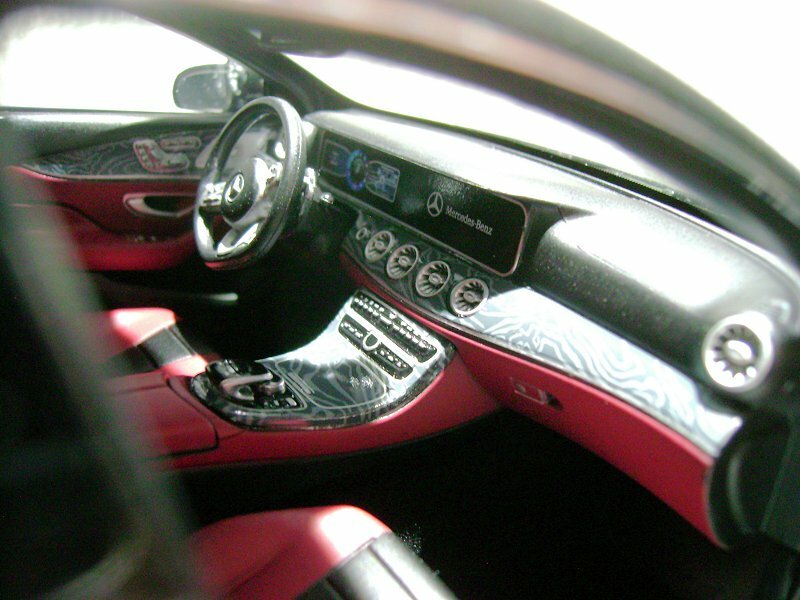 the red interior. 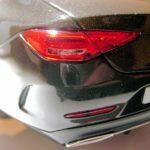 However, if you neither like the front nor rear lights, why do you care to buy a model of it at all? 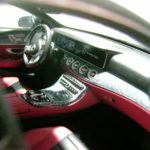 1 – Regarding a third color; Both red and gray have a Mercedes-Benz reference. 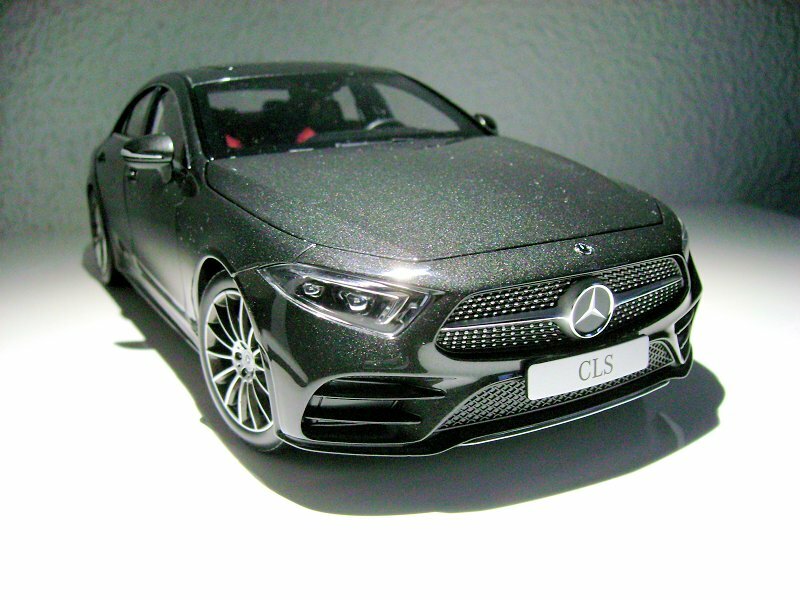 If you are a little informed, you will know that Mercedes usually takes each model of its catalogue in at least 2 colors, and then the manufacturer of the modelcar usually takes a third color. (For example, in the case of the AMG GT Roadster, Mercedes sells the blue and the matt gray and Norev has taken the yellow. 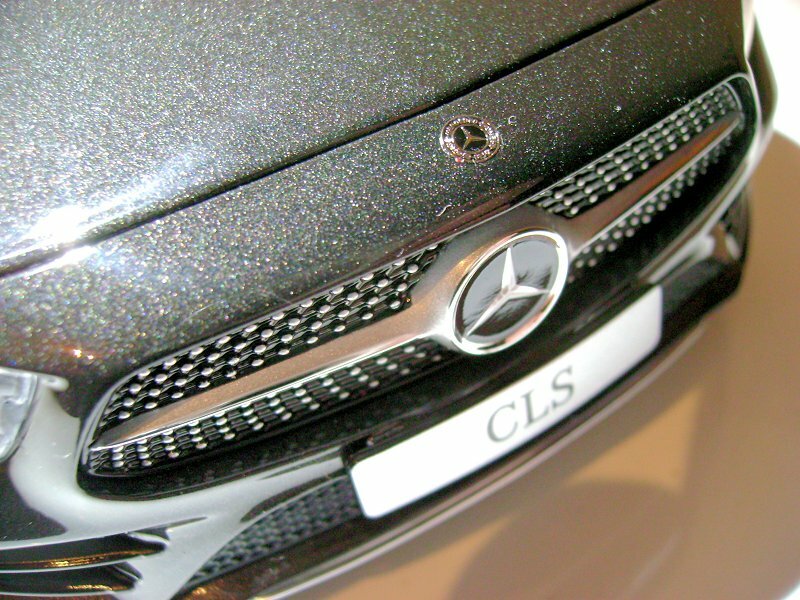 Or the last V-class that Mercedes sells in red, white or blue and Norev does it in black. Mercedes is my favorite brand. 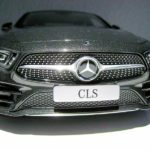 I have 1000 modelcars at 1:18 and 20% are Mercedes. And I like to see the evolution of the design of a model along the years. So that’s the reason why it will end at home. In the end I was right and Norev is going to get a third color from CLS. In addition to the red and gray, now there is another in black with silver rims. Sadly it is not white or silver. There is always a possibility of another color by Norev and we hope for an AMG version in white/gray by GT Spirit.